After hunting and fishing all of my life in Pennsylvania and Maryland there were some notable differences when I headed West. With the holiday season just wrapping up my in-laws have flown home, my mother-in-law to the east and my brother-in-law to Washington State. After living here for a few months I’ve apparently adjusted quite well to the altitude, only struggling at 13,000ft and above on longer hikes, but what I didn’t bother mentioning to my athletic brother-in-law is that our house sits at an elevation he is normally camping in the mountains in Washington. When he went for a several mile run he was wrecked. He bounced back no problem, but he was wiped out for the rest of the evening. If you’re coming out to Colorado to hunt the mountains, or even the prairie on birds — the altitude adjustment may take a day or two depending on your level of fitness. One notable and amazing benefit of moving west out of New England and the colonies was that I was able to free up Sunday for hunting. It would seem when I talk to hunters in Colorado that it’s never been frowned upon to hunt on the Lord’s day out West, it’s just part of life out here. When I grew up we had to plan to be fishing on Sundays in Pennsylvania since it was thoroughly discouraged, though not by state biologists to hunt on Sundays. Moving to Maryland for work they had very generous bag limits for game both small and large because of the small licensed hunter population but they too did not allow Sunday hunting because of the state’s Blue Laws that are slowly but surely beginning to loosen. Being someone who can work a flexible schedule, living out west means that I get three days a week that I can hunt for my naturally longer weekends. However, with most folks working a traditional 9-5 and more and more people having to move to urban areas to find work — especially as jobs become more tech heavy — it’s not exactly easy to go out for a morning or evening sit. Most people who live in states dominated by Blue Laws will continue to have only one day to hunt on the weekends until they can lobby their local legislatures for change. One notable difference in heading West is that the game management units are divided up much more granularly than they are in the East. 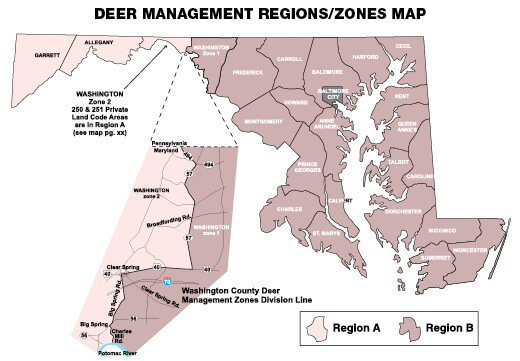 In Maryland there are largely two hunt zones when taken into account for deer and bear, A and B. It’s seemingly ridiculous that not only are there only two hunting zones, but B is much larger than A.
Maryland hunting zones for whitetail and sika deer straight from their website. In Pennsylvania management is more granular but is generally divided by the stretches of highway that create a latticework across the state. Some dividing lines are rivers. Pennsylvania Wildlife Management Units, pulled directly from the Pennsylvania Game Commission Website. Pennsylvania is able to monitor deer herds in a much more granular way by having their GMUs bound by highways — but that’s not how animal herds really work. Those are man-made barriers that it’s clear everything from a snake to an Elk don’t care about crossing. Animals are generally resident to watersheds with high mountains or other natural barriers acting as barriers to expansion of their home range for all but the most adventurous critters. 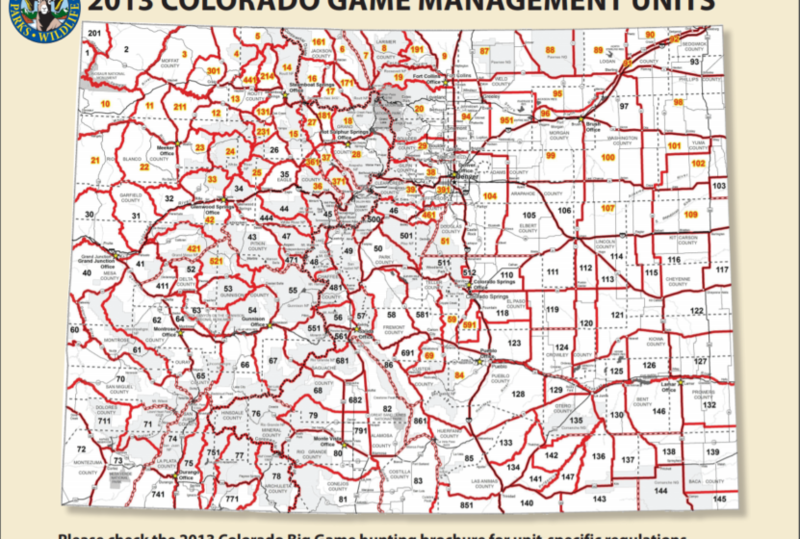 Colorado breaks their Game Management Units down much — much more as shown below. It’s almost impossible to know all of the management units, but it provides for a much more granular tag management system in the state. Am I a Disney Princess? One of the things that was really difficult to get used to was the bird hunting in the mountains. In my job I meet a lot of people from all over the United States and whether it’s by our relaxed dress code allowing me to wear hunting Tee shirts or whether it just comes up naturally, people often ask what I chase the most. The answer is almost always “grouse”. 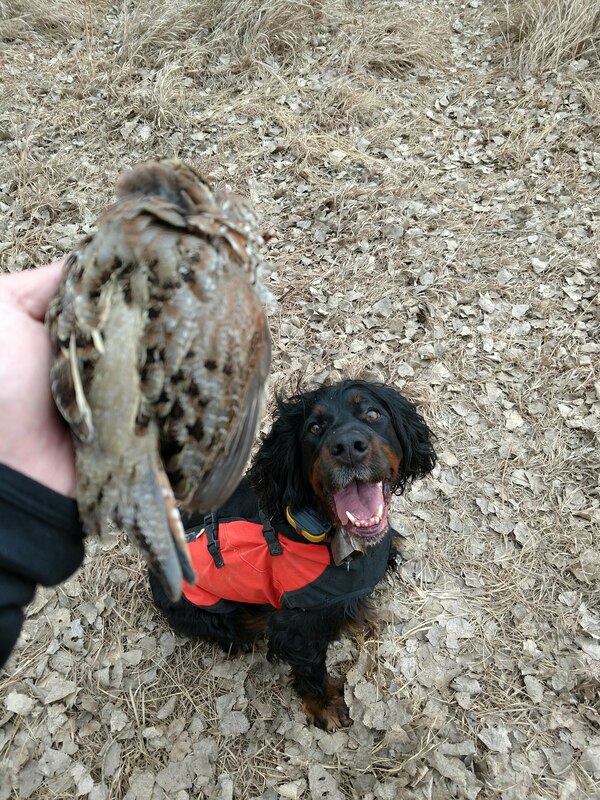 While I spend more time in the deer woods, the most rewarding and humbling hunting I’ve ever done is that for the Ruffed Grouse in the coverts of Pennsylvania. When I mentioned that to midwesterners or people from the inter-mountain west they greeted the hobby with some amount of disdain. Many of these folks grew up taking potshots at grouse with a .22 or saw them routinely on dirt roads and trails, as dumb birds, Fool’s Hens that only moved when you got on top of them. After my first season here on Blue grouse I began to understand that they’re much more sporting to hunt with dogs to take them from a point, and flush them to the wing. Otherwise you’ll be ground swatting blues all day — once you find the buggers. My very first encounter with a blue was up on the Continental Divide in an area that resembled alpine tundra, and turning the corner around a dense grove of pine trees there it was, big as a Rhode Island Red rooster just scratching and eating. It looked up, I took a step to attempt to flush it, and it took four or five rapid steps to relocate. To any onlooker it must have looked like a Three Stooges skit as I attempted to get it to flush. A shot at that range would have ruined any meat, and I did want to give the bird a fighting chance. After perhaps three minutes of fooling with it, the bird eventually ran off into the thick juniper matting the ground and that was the last I saw of it. One of the most interesting interactions I had with the CPW (Colorado Parks and Wildlife) staff was to ask about trout fishing. I asked about when seasons opened and closed the question was met with some amount of confusion. Apparently the seasons on trout never close in Colorado, the creel limits may change but as long as you can access the water and pay attention to harvest restrictions such as artificial lure only areas, you’re good to go. One of the more interesting things I noticed when I moved here that struck me as odd was the decidedly lax blaze orange requirements. 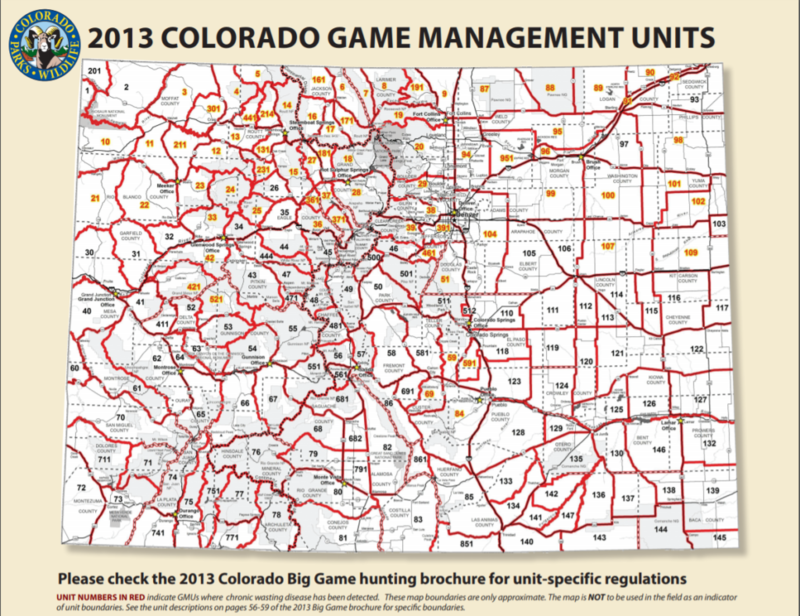 If you’re hunting small game, there’s none required at all in Colorado. To be fair in Pennsylvania the only requirement was a hat, with most folks wearing a hat and a small game coat with some amount of orange on the game bag and trim. Having grown up with my father who hunted big game in Franklin at the the time when the clear cuts were massive and far reaching as well as the crowded coal country near Karthaus he always wore as much orange as humanly possible. He told stories of hunting in the 70’s and hearing bullets whizzing by so you never silhouetted yourself on the large boulders that would have given you a significant visibility advantage for fear of being shot at. In the east you often see older gentlemen wearing so much orange that the firearms season participants are often referred to as the Orange Army. For big game in Colorado the requirements are largely the same requiring both a hat and a vest — but I haven’t seen folks go quite as over the top with their orange outfits. While Colorado is known for their over the counter tags that people flock to the state for during big game season for Mule deer and Elk a majority of the areas also offer tags using a points system for draws. The more scarce the game, the harder to draw tags. Colorado offers draw units for practically every large game species including turkey, elk, deer — both whitetail and mule deer, mountain goat, big horn sheep, and moose. In Pennsylvania the only lottery that even exists is for Elk, a herd that is beginning to really take off! In Maryland black bear is a lottery system, Marylanders were always amazed I was able to hunt bear every year just a few hundred miles north. I’ve been a bird hunter for as long as I can remember. Probably because it was way easier and less stressful for my father to throw my brother and me into small game jackets and walk the old logging roads of Pennsylvania Game Lands for grouse at a young age than to sit silent and still in a deer stand for hours. Pennsylvania offers good hunting for Ruffed Grouse, Stocked Pheasants, our migratory Woodcock, and snipe — though people rarely target them. In Colorado you have pretty much every upland bird you could possibly imagine with three varieties of quail, sage grouse, blue grouse, sharp tailed grouse prairie chicken, wild pheasants, ptarmigan, and mote! I have a tough time keeping all the seasons straight which is why I throw them all on a Google calendar when they’re released for the year. It’s hard as a bird-dogger to target and specialize on just one species until you learn it. There’s so many opportunities that it’s difficult to hone in. Finally, the last large distinction is that despite the howls on the various hunting and fishing Facebook groups I follow about the influx of folks in Colorado hunting and recreating on “their” public land — the state has a ton of land open to the public. I was spoiled growing up with access to the Allegheny National Forest each weekend — 500,000 acres of greenery and multiple State Game Lands parcels of tens of thousands of acres. When I lived in Maryland there were still large wildlife refuges like Blackwater National Wildlife Refuge but the hunting I did was mostly on 250-500 acre parcels of State Wildlife Areas that were quite far from our house that had to be commutable to the Army base I worked on. 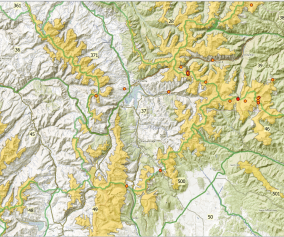 In the West there are a lot more options for public land hunting, owned by you, the taxpayer. However the average outdoor recreator needs to be way more studious as to which pieces of public land they want to go tote a gun and wear their orange whilst looking for critters. Open Space for example is a type of park that exists in the west that is not open to hunting, despite the trail systems put in and the small game availability. It would be like hunting at a public park where Jimmy is playing on the monkey bars — just way less developed. State Trust Lands in Colorado have some open to hunting and some not, Bureau of Land Management lands are mostly open to hunting but it’s something that needs to be checked on a parcel by parcel basis. 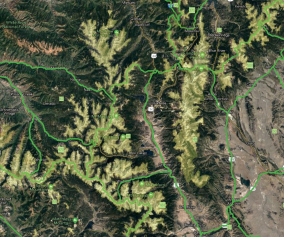 However the National Forests and Wilderness areas are very numerous… to the extent where I’m not sure I’ll be able to achieve my New Years Resolution of hitting them all, especially with a baby on the way! Make sure to do your research on each and every parcel of land you intend on hunting or fishing since the regulations have a tendency to change based on ownership and time of year. So there you have it. 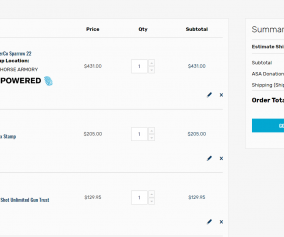 I’m sure there are way more differences that I could have mentioned, like the requirement for a second rod stamp if you’re fishing with two rods in Colorado — but those were the biggest points of difference I noticed in my first season. Have some other interesting East vs West differences? Write us through our website or hit us up on Facebook or Twitter!